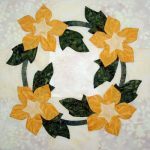 I have never been involved in an online challenge, although I have taken part in quilt guild challenges. When Marian of Seams To Be Sew first asked me, this theme popped into my head immediately. 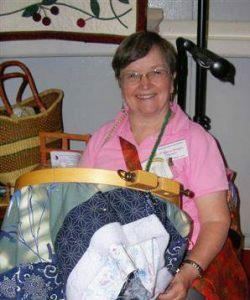 She is working in tandem with Amy of Sew Incredibly Crazy. The free download of My Road to Tehachapi, (12″x 40″), is available until the end of October. The future pattern will have some added railroad cars. Click on the Craftsy button for the free pattern. Or click on the picture to take you to Craftsy for the free pattern. At the present width of 40″, it would make a great headboard for a toddler’s bed. The passenger car could be repeated to make the wall hanging long enough to fit across a whole wall or maybe a window valance. Wouldn’t it be fun to print fabric pictures of the child and the family to put in the windows? Driving between Tehachapi and Bakersfield via State Highway 58, you see a lot of trains, tunnels, and tracks winding through the hills. You will notice that the actual hills are not quite as bright green as the quilt. I am doing a little wishful thinking and taking some artistic license. You also see the historical Loop, that was built by hand between 1874-1876. 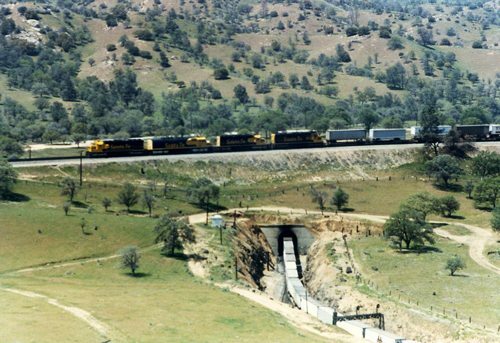 One of the engineering feats of its day, the Loop was built to ease the grade over the Tehachapi Pass. The name is derived from the circuitous route it takes, in which the track passes over itself, a design which lessens the angle of the grade. The train gained only 77 feet, but in the days of steam engines, every little bit helped, when it had to climb from 800 feet elevation to 4,000! Construction began in 1874, and the line opened in 1876. The quilt shows a passenger train, but today, only freight is allowed on these tracks. Although, on rare occasions, the Coast Starlight is rerouted through the Tehachapi Mountains due to problems on the coastal route. These prizes are available to you today and until September 22. To register to win, click on the prize image to take you to the link. Part of entering the contest is to leave a comment below. 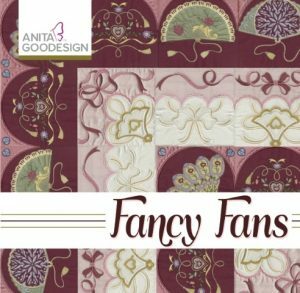 The first is from Anita Goodesign one of the top embroidery design companies around. Some really beautiful designs are available on their website. Click on the logo to check out the company. Click on either image to take you to the site to register to win a CD-ROM of machine embroidery designs. 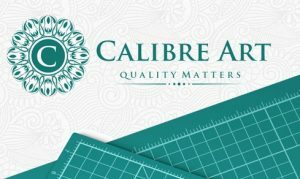 The next prize is from CALIBRE ART Cutting Mats. Read all about it at the link. These are top of the line cutting mats, made with a lot of thought and care. 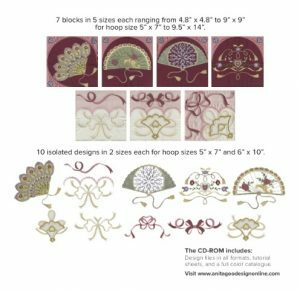 Click on the image to take you to the site to register to win a 12″x18″ cutting mat. When you see it, you will also see my book listed, but there is an arrow if you want to register for the cutting mat instead. It is a two part giveaway, combined with my book! You can enter both giveaways! Even though some of the Row Along Reveal days have passed, all of the designers are listed. Just in case you missed going to those blogs, you can still download their rows. YAHOO, I won the Calibre Art Mat. I gifted it to a quilting friend who lost everything in the Louisiana Flooding. Amazon will be shipping it right to her. That is so generous of you. I was wondering if there is any quilting organization out there helping those quilters in Louisiana who lost everything. I would think so, but haven’t heard of one. What a fun row! Very beautiful and creative! Thanks for sharing!! Your train is delightful! I love all the details that keep the eye moving! The green hills are so colorful! Very interesting info about the train and tracks. Great row! Such a cute row block! Thanks for sharing your lovely row! Great row! I had no idea the train there looped around like that. Also, I love your artistic license with the green hills, lol! Would have been pretty drab looking otherwise! Your row would definitely be a great headboard for a toddler’s bed. Love the row and the history behind the train. Thank you for sharing. Love your row! Great job! My grandparents lived in Tehachapi years ago and I visited there once. Thank you! We love the area. My brother loves trains. He has models and train sets everywhere. I have plenty of orphan blocks with train fabrics, now I can add to this budding quilt a row with a train. Love your row. This hop is so creative and inspiring. Such great designers. Thank you! Hope you send me a picture when you get it done. Your row is one of my favorites! What a beautiful block, makes me want to visit the area to learn more. Love being able to ride vintage trains and visit areas that keep their history alive. Thanks for sharing your wonderful talents. You never cease to amaze me with your creativity. Thank you! 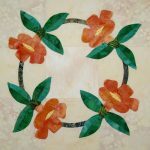 If you should visit, make sure you visit our two quilt shops, Debbie’s Fabrics and Five Heart quilts on Tehachapi Blvd. There is a railroad museum there too. Hi Barbara, Thank you, I love your row. What a shame that only freight trains move along that line now. The view must be amazing. Thank you! Some of the older residents of Tehachapi, remember taking the train to Bakersfield. I so like your mountains and trees. Your row makes me want to go on a mountain train ride. Rode on the Narrow Gauge in Colorado; what fun! Unfortunately, no train rides through the Tehachapis, just freight trains. Great row and interpretation of the theme! I’ve seen this area many times on vacation in my early years – always looked forward to seeing those trains!! We enjoy seeing them every time we are on Hwy 58. What a beautiful row based on a beautiful area! My husband is a train buff and every where we travel, he scopes out the trains. I’m adding Tehachapi Pass to our travel list since retirement is only days away and we will be on the road! 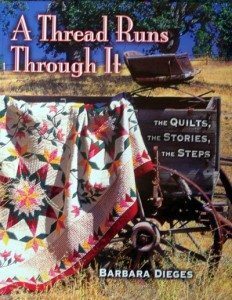 Make sure you stop at our quilt shops in town, yes shops, we have TWO on Tehachapi Blvd. Debbies’s Fabrics and Five Heart Quilts, within walking distance of each other. Thanks for the cute row by row block. Love to share my stuff! I love your train, and the info on your inspiration. Thanks for sharing. What a wonderful row. Reminds me of a train tour my Husband and I took. I love trains, thanks for the great row. Thanks for a cute row. You have some great ideas for using the row in a child’s room. I enjoyed reading your post. Great idea, a few cars between the tunnels! This is such a GREAT row! One of my favorites yet that perfectly depicts the pictures of your area. Thanks for hopping!! I love your row. It would look good on my grandson’s headboard or dresser. He loves trains,,,,and cars and trucks and boats. Thanks for sharing! Hope you send me a picture, when you get it made! Thanks for the train design, and the history of the area. That’s really cool info! It is always fun to delve into our history. Nicely done! As a native Californian, I think you captured Tehachapi! Please send a picture, if you make the quilt! My grandson would love it if I made his this row! He loves trains! What a lovely block! It would indeed make a great headboard quilt for child. Thank you. Your row reminds me of a train trip I took as a child. Thanks for sharing your talents. You are welcome, we love trains too. Picture makes me dream of taking a train ride! Love the train, great way to travel! What a nice row. This may have to be made into a quilt for my train obsessed grandson. Thanks for sharing. Thank you for the compliment! Please send a picture when you get it made. Well nice ideas, thanks for sharing your talent with us….. Very cute row!! Love the train!! I have 3 boys and they love trains. A train quilt is in my plans! A love learning about new places. Hope you will send me a picture when you make it. A very nice pattern. I am enjoying reading the background stories of all these patterns. I am learning so much about different places I have maybe not heard of. Thank you! I am learning a lot too. I love your row and the row along-we get to learn about see other parts of our wonderful continent! Thank you! You are so welcome, it has been fun learning about faraway places that I will never visit in person. Great row block, and I love how you have shared a variety of ways to use it! This would certainly be fun for my grandsons! I have spent some time in both the Bakersfield and Tehachapi areas, so it was fun to read a bit of the history. Once I started putting it together, I kept getting more and more ideas, but had to stop with 40″! My two sisters were born in Bakersfield. Would love to go back. Love your block. We really like the area, glad you like the quilt. Cute row! Thanks for the giveaway opportunity! Glad you like the row AND the giveaway! love you train row. My grandson will stop everything he might be doing if he hears a train going by. How cute! I think that grandson needs to have you make this train quilt! I love the train, it is perfect! What a fun row! Thank you! It makes me smile every time I look at it. Love trains, love Tehachapi, love your row! Thank you for sharing it. Thank you, we love Tehachapi too. I love the idea of putting different scenes in the windows to have different things riding the train. So cute.Thank you for making this cute pattern. Very nice! I know a young boy who loves trains and this would be perfect for him. Thanks for sharing your row with us. Love your train. Thank you, this is exciting! Oh, this is adorable. I love trains and I can just see little faces in each of the windows. Thanks for the free pattern – I love that it is pieced. Love appliqué, but for this piecing was called for. This was a great row and it was beautifully designed! Tehachapi is a very historical area. What a great looking row! Love the train. Love your train trip thru the country. What a fun row! Cool row, and thanks for the history lesson. 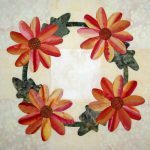 I love your alphabet flowers! Appliqué is what I love to do, but then something like this comes along and I can’t resist! This is such a fun fun row, I really love this one and some great ideas to add to it also, the printed photos, fabulous idea. For a first event, you’ve pulled this off beautifully Barbara, I hope you will join in future events, it’s been a sheer pleasure just getting to know you better. Would love to see what you do with it!. I love your row, a great depiction of a very interesting area, thanks! Thank you, we love our home area! I sooo want to take a train ride!!! Me too! We love the train, great way to travel! I love trains and would love to see this place in person. Thanks for the history and the block. It is fun to see the trains do the loop! I LOVE this row! It would be beautiful in a child’s room or for anyone that loves trains (Like my 25 year old grandson). Thank you for sharing. Wouldn’t that be a great Christmas present! Send a pic if you do it. I love your road home. Actually I love all your designs. Thank you for your generosity. Thank you, I love to share my stuff! Trains. I tried to get a caboose in my row but gave up. I tried to make it tooo detailed. Keeping it simple is the way to go, just put fewer windows and change the color. Yes we are always on vacation, because this is a vacation spot! You are very welcome, I have had fun doing this too. I love your work! This train is wonderful and I like the idea of photos in the windows. Love your quilt block and the story you shared. I always enjoy the historical backgrounds! If it hadn’t been for this challenge, I wouldn’t have done this, although I had thought about it many times. Your row is beautiful and really represents the train and the mountains so well! Thank you for the time you spent making this beautiful row. I appreciate your generosity. I love the train. It looks like a fun ride. Ohhhh, love your little mountain train…such a fun quilt. Thanks for sharing! One of my favorite rows – this is amazing, love it so much!